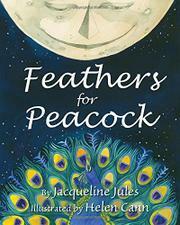 A wintry tale of how the peacock got his colorful feathers and of the power of kindness. In the early days of the world, birds did not have feathers to shield their bodies from the cold. Seeing other animals that have shells or fur, Hawk and Eagle seek advice from the wise moon. The moon promises that if the birds rub up against the flowers and plants at dawn, when the moon and the sun are in the sky at the same time, they will be clothed—but Peacock, sleeping in his cave, misses this moment. Seeing his naked body, all the birds each chip in one of their feathers, and with the help of the wise moon as well, Peacock gets his distinctive look. Cann’s vivid paintings bring to life the colorful plumage and seasonal stages of the story, jewel colors enlivening both flowers and feathers. In an afterword, Jules provides further information on peafowl and explains that she was primarily inspired by “El Plumaje del Múcaro,” a Puerto Rican folk tale in which a múcaro (owl) acquires party plumage with the help of the guaraguao (hawk). Puerto Rican readers and those otherwise familiar with the original may well be taken aback by the erasure of its cultural distinctiveness in service of Jules’ artistic license.